Little known fact about me – my original dream after culinary school was to open a hand-crafted ice cream shop here in Ferndale, Michigan. I’ve loved making (and eating!) ice cream since my parents and I use to make it in an old wooden barrel machine when I was a kid. I also love inventing new flavors – no matter how strange of an idea you have, you really can’t screw up ice cream that much. After all, even if it’s a little weird, it’s still ice cream. So what happened? About a week before I started culinary school, Treat Dreams opened in downtown Ferndale. It was like the owner had read my mind. It was exactly what I had wanted to do, he just beat me to the punch. And he’s now wildly successful at it. While part of me wanted to be a bit scornful, I couldn’t hold it against him. Treat Dreams is amazing and they deserve all of the success in the world. Taking a cue from the most mellow song in the world, “Banana Pancakes” by Jack Johnson, I unleashed my inner ice cream chef to make this creation. 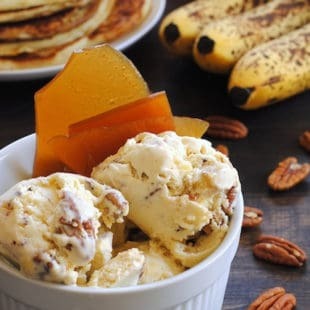 The flavor can best be described as a mixture of butter pecan ice cream, bananas foster and maple syrup-drenched pancakes. Treat Dreams, if you’re reading – you can use this recipe, but you have to name the resulting flavor THE LORI. Cut pancakes into 1-inch pieces. Place on parchment-lined baking pan and transfer to freezer. In medium nonstick skillet, melt butter over medium-low heat. Add pecans and salt; cook 4 to 6 minutes or until pecans are golden brown, stirring frequently. Remove from heat; use slotted spoon to transfer pecans to medium bowl. Reserve butter in pan. Add bananas to pan; cook over medium-high heat 4 to 5 minutes or until bananas are caramelized. 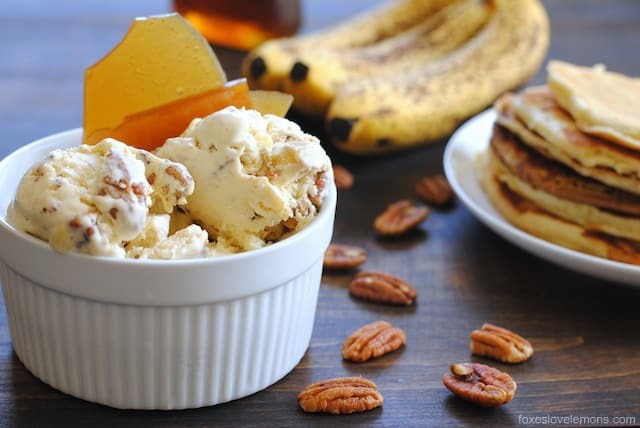 Transfer bananas to bowl with pecans. Cover and refrigerate. In medium saucepan, combine milk and cream. Split vanilla bean in half; use blunt edge of a paring knife to scrape out seeds. Stir seeds and bean pod into milk mixture. Bring mixture to a slow boil over medium heat. Reduce heat to low; simmer 30 minutes, stirring occasionally. 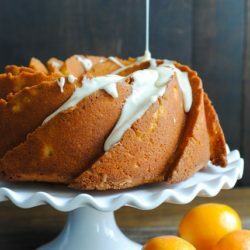 Place eggs, egg yolks and sugar in mixing bowl. Mix on medium speed 2 minutes or until thick and pale yellow in color. In a slow, steady stream, add 1 cup of hot milk mixture to egg mixture. When combined; pour egg mixture into saucepan with remaining milk mixture. Cook, stirring constantly, over medium-low heat until mixture is thick enough to coat back of spoon. Strain through fine-mesh strainer set over a large bowl. Cover with plastic wrap placed directly on custard; chill completely. Pour custard mixture into your ice cream machine and freeze according to instructions for your machine (mine took about 20 minutes). Two minutes before churning is complete, add reserved pecans and bananas, and frozen pancake pieces. Churn until everything is fully incorporated (if it’s too much for your machine to handle, you can also fold this stuff in by hand). Transfer ice cream to freezer to harden completely (at least 4 hours). Serve garnished with Maple Syrup Brittle. Oh my gosh! I can’t stop staring at the picture of your ice cream. It’s so creative and looks out of this world!! OMG Lori, the flavors! I love ice cream just as much as you, and this is a killer idea! And so creamy. Pinning this recipe. I’ve been waiting for this since I saw your teaser pic. I’ll be right over. I couldn’t wait to see this recipe after seeing the sneak peek photo preview in the forum. Fantastic! There is definitely room for more ice cream shops in the area, particularly if it’s yours. The ice creams you come up with are so creative and sound like I’d be making one too many stops at your shop! That is such an inventive ice cream, I love it!!! What a gorgeous bowl of ice cream! And that maple brittle is an outstanding garnish!!! Thanks Liz – my jaw and teeth don’t appreciate the brittle so much, but what are you gonna do? haha. Haha yeah, I’ve thought about it. But I’d always be that woman that “is trying to compete with Treat Dreams.” Then I’d be all like “but but but….I came up with the idea ages ago! Before Treat Dreams. Please don’t hate meeeee.” hahaha. THIS is an awesome flavor. “The Lori”…breakfast in a cone! Haha yes! 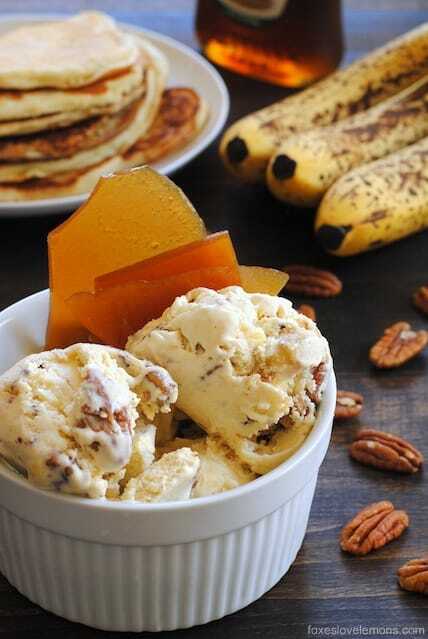 If it were a waffle cone, it’d be like eating pancakes AND waffles at once! Pretty much all my favorites in one delicious treat. Totally delicious, I’ll take mine with a side of bacon!! You know what? For a brief moment, I considered putting bacon IN this ice cream. Alright…..who needs the Ritz, anyway? haha. When I was a little girl it was a special summer treat to make ice cream in the hand crank machine. Everyone took a turn and the men took over towards the end of the cranking since the ice cream got harder and harder to turn as it froze. Good times! 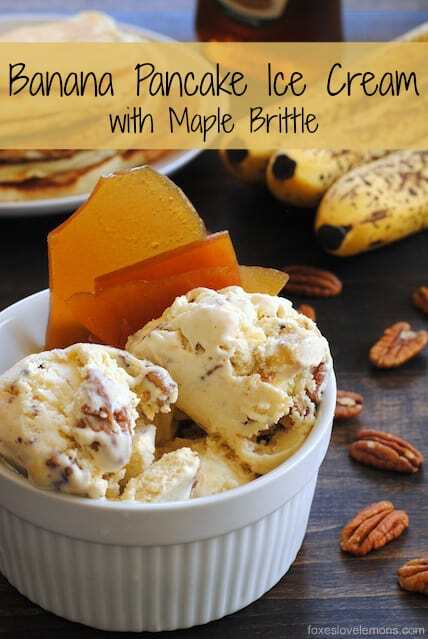 Your ice cream sounds fabulous with the bananas and pancakes and – oh, my double goodness – that maple brittle! Such a great combination of flavors, Lori! Treat Dreams should hire you as a consultant. Aww, glad to hear somebody else has fond childhood memories of making ice cream. It’s seriously one of my favorite memories. I LOVE this idea! I’m currently making a lot of ice cream for a challenge in Sept but nothing so creative. Pancakes? Brilliant! And maple brittle? Oh, I’m a puddle on the floor. You’re in an ice cream challenge? That sounds so fun! What flavors are you making? It’s not an ice cream challenge per se, but the Vegan Month Of Food is in September and a lot of us like themes. This year I decided on ice cream, but making 31 flavours in 1 month is rough so I’m trying to get a bit of a head start! So far the faves have been Peach Melba, Strawberry and PB&J! Ohmigoodness. Growing up, my dad would make banana pancakes every other weekend. I have to try this ice cream! Your Dad sounds like a great cook, Kim! This sounds increeeeedible! Creating new ice cream flavors would be a fantastic job! But the market is way over saturated here in Columbus too. We’re home to the famous Jeni’s Ice Creams. Oh, I’ll have to check that out next time I’m through that way. I believe I’ve heard about Jeni’s- either on tv or in a magazine. Thanks Angela 🙂 Ice cream makers definitely go on sale in August and September! I think I scored mine at a discount from Williams-Sonoma about that time a few years back. Keep your eye out, because it’s SUCH a fun family activity! Love this song and this ice cream looks amazing! I would be in heaven with a bowl of this. 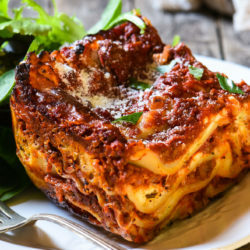 WOWOWOW what a recipe! This is so genius and looks delicious. Awesome job! This sounds fantastic and looks super delicious! I love your pictures! where I share some of my favorite web finds from the past week. I loved the idea of this ice cream recipe so much that I had to include it in this week’s post; I also featured one of the photos, of course with credit linking back to this url. I wanted to thank you for such a great idea and recipe, and have included the link to the wrap-up in case you’re interested. Thanks so much for including me, Jess! Of course, breakfast ice cream for everyone! Oh WOW. What an amazing batch of ice cream! I adore pancakes. I eat them with ice cream all the time, but adding the pancake TO the ice cream batter… that blows my brain. Wow. Definitely trying this!